Behaviors, durations, severity, and the overall journeys will differ. Vastly. There will likely be many similarities and commonalities, but all the terrifying stories you may hear do not necessarily have to come true. That said, just getting Dementia with Lewy Bodies is a horror show on its own. After diagnosis, don’t be convinced that a change or symptom is permanent, nor that it is the inevitable sign of the dread “final stage.” It could be…. but it could also be one of the constant fluctuations that bounce many Lewy Body Dementia sufferers all over the board. I have seen both incredible rallies from frightening low-points, precipitous drops in ability and cognition, gradual declines, and improvements. But more than anything, I have seen the condition fluctuate widely, with extended periods of consistency. More than anything, be aware of exactly what is going on with your loved one, without preconceptions of what something means, or is a sign of. This requires sensitivity, careful observation, and patience. Remember that the conditions change, sometimes in an instant, so the behaviour you are witnessing right now, may be very different a moment from now, and you may have to act accordingly. Learn as much as you can. There are many sources of information online, in books and on video and, hopefully, in person. Be patient with yourself and with the one you’re caring for. They may surprise you more than you expect: I hope it’s a pleasant surprise. There will be no shortage of unpleasant ones, so celebrate every single positive one, and some of the neutral ones, too! Again, every person with Lewy Body Dementia is going to react somewhat differently. Don’t base your expectations on the experiences of someone else. The famous, or infamous, cases like Robin Williams will likely bear only passing resemblance to your own experience. The only constant we have is the unpredictability of Lewy-Body Dementia, as we wait once more for the Lewy-pause to end and the precipitous decline to begin. The wait is extremely difficult because there seems to be no way whatsoever to know when the next change will arrive. Soon, in the future, never? In a way, that can also bring one tiny element of comfort sometimes since one never knows if any issue will develop, or whether something that is dreadful will ever recur. Your essays are so well written and give me information that is helpful in navigating our journey. Thank you so much. Thank you for your kind comment, Joan. We need all the help, advice and information we can, and much of what we need to know is common to each other. 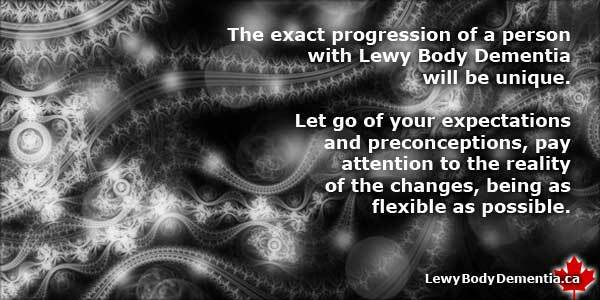 May your journey with Lewy be the best it possibly can be. I’m sure it will be, too — you’re doing everything right by preparing and trying to know as much as possible. Mr. Hudson, first of all thank you for the wealth of information you have provided during this terrible trip LB trip that we are on. Feelings of defeat is a phrase I have used several times lately. My husband was first diagnosed with Alzheimer’s Disease two years ago around August 2016. But, I had noticed a decline in his thinking process many years before then. His PCP would just say it was all age related and probably partly due to medications he was taking for his heart since early 2007 when he suffered two heart attacks back-to-back. His AD medications have been adjusted so many times since his diagnosis because of the fluctuating symptoms we have dealt with. Now his PCP and Neurologist both agree he has LB with Parkinsonism and behavior issues. He is verbally abusive most of the time and he has been physically violent on occasions. His obsessive paranoia over material things has caused his grown children to stop coming around us. At one point a few weeks ago I dialed 911 and asked for an ambulance and sheriff to come and take him out of the house because I was afraid of what he might do to me. The police came first and tried to speak to him while he was spewing threats at me. But when they asked him if he thought he needed to go to the hospital he said no. I was told by them later that they could not do anything if he didn’t want to go and the things he was saying to me were only words. Since then I have found out that he is too aggressive to go to a NH with a Alzheimer’s spot. They have concerns that he may become violent and injure himself, another resident or a staff person. I’ve also been told that he is not aggressive enough to meet criteria for a Geriatric Psychological evaluation. They told me that he would have to be constantly violent to meet criteria. His doctors want him in Memory Care but he makes a few dollars too much on his SS and that disqualifies him for that type of care. He hasn’t worked in about 20 years and now that he needs this care he does not qualify for it. He is still at home and just last week started refusing to take his medication! Seems all legal bases have been covered but we are at a dead standstill for now. Just waiting. Unless he badly injures himself, me or a family member, he does not qualify for placement anywhere. Whats wrong with our system? You work hard all your life and try to live as good a life as you can, but then you find out only if you had lived in poverty you don’t get the help you need at the end of your life . Middle class does not qualify for any assistance in things like this. Wow, Virginia. I am so sorry to hear about your situation. That’s so very punishing, and undeserved from every angle. I can’t comment on the US system, and suspect that each jurisdiction has somewhat different particulars. It’s so amazing, and tragic, that there seems to be no sensible solution. > If I were you, I’d do three things: firstly, take all precautions for your own safety first. Even if he’s not exactly “psychotic” the article link below will hopefully give you some tips on what to do to keep yourself safe. That is paramount. Secondly, I’d post your situation to one of the big FaceBook support groups. I co-admin the two largest in the world, and can attest to the incredible knowledge and compassion of the group members, and some would likely have suggestions for you. Finally, I would keep advocating — I am sure that at some point, you’ll break through.